An economist with the Department of Economics, University of Lagos, Akoka, Dr Femi Saibu has declared that Federal Government (FG) policies on the Information and Communication Technology (ICT) revolutions were not production and manufacturing-sector oriented, reports ITRealms. Speaking as lead guest at the WorldStage Economic Summit 2016 in Lagos, Dr. Saibu said Nigeria’s revolutions in ICT policies were merely employment destructive and service oriented. He stressed that these series of jobs always ended up in creating social media entrepreneurs with no employment multiplier. 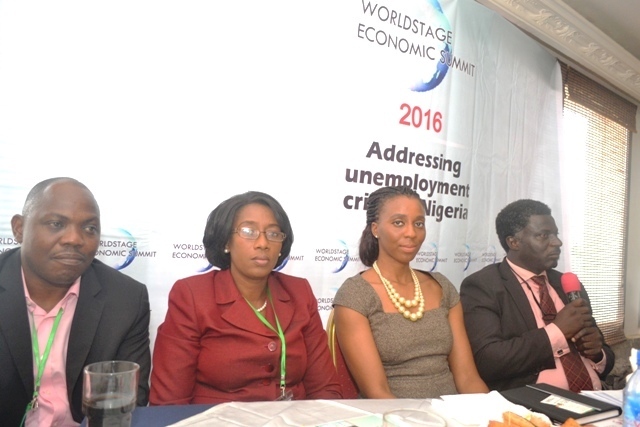 At the summit organised by World Stage Limited with support from the Central Bank of Nigeria, Shell Nigeria, United Bank for Africa, Bank of Industry and Zenith Bank, the scholar said what the country needed were large scale industrial set up that can mop up the thousand of unemployed youths. He said the country needed the establishment of businesses with value chains in productive sectors with greater employment multiplier and government spending in key sectors to provide basic infrastructures that reduce cost of business. “Not direct underemployment of youths in any disguise that create fiscal cliff. Innovations and technology that lead to higher productivities and not those that take jobs from men to machines," he said. Other economic stakeholders who spoke at the summit chaired by Mr Soji Adeleye, MD/CEO, Alfe City Institution include, Mr. Mordecai Ladan, Director, Department of Petroleum Resources, Mrs Omolara Aromolaran, MD/CEO, Crown Natures Nigeria Plc , Dr. Gloria Elemo, Director General/CEO, Federal Institute of Industrial Research (FIIRO), Mrs Efua Edeh Executive Director, Junior Achievement Nigeria, Barrister Sunday Oduntan, Executive Director, Research & Advocacy, Association of Nigerian Electricity Distributors, among others. Barrister Oduntan in his presentation ‘Getting The Power Sector Right To Boost Productivity’ said the power sector was facing many surmountable huge and difficult challenges that had made it unable to play its role as the engine of growth for job creation. “The whole electricity supply chain still remain comatose; the promised increased generation and reliability as part of privatization –has not happened; generation continued to hover in the mid-range of 3000 to 4000 Mega Watt; energy theft and meter bypassing are very rampant; and insufficient number of meters due to liquidity gap and massive shortfalls,” he said. Additionally, he said “GENCOs have been bedevilled by gas supply issues, cost and vandalization of gas pipeline networks in Nigeria, delay and frustration in construction power plant sometimes on land and contract” noting that there is hope for the sector if some milestones such as funding of liquidity by subsidy and private sector fund, incremental generation, stability and security in generation we can achieved. “Revenue gap from minor review must fully recognise the variance in forex applied by Gencos and drop in generation for six months,” he said. Other milestones he prayed for include that MDA debts must be paid, focus on transmission funding and security of power supply, cost-reflective tariffs for DISCOs, strong and independent regulator, continuous and sustained investment on electrical infrastructures particularly TCN, aggressive metering across the board must be sustained. The DPR boss represented by Mr Kanmi Ayodeji, Manager, Planning, in a presentation ‘Nigeria’s Oil & Gas Reforms- Boosting Indigenous Participation & Energy Security’ said current reforms, initiatives and strategic plans in the oil sector were capable of boosting economic growth and create jobs. He mentioned reforms such as initiated the modular refinery strategy to boost domestic refining capacity, improve supply of petroleum products and create direct and ancillary jobs. The FIIRO boss who was represented by Dr Dele Oyeku, Director, Extension & Linkage, said there was no reason why Nigeria should be facing unemployment crisis if government can implement the research findings of institutions such as FIIRO. For instance, he said there was an initiative on cassava substitution for wheat in baking which can generate millions of jobs across the country. She also noted that Nigeria and Nigerians needed to start producing what are essential to enhance our economy and create jobs. Also in her paper on ‘Promoting Youth Entrepreneurship for Job Creation’, Manager, Marketing and Communications, Junior Achievement Nigeria (JAN), Tobe Ifeanyi who represented her boss spoke about how non-governmental agencies could help in solving the unemployment problem in Nigeria, saying, since inception, over 650,000 students in more than 750 schools in 29 locations across the country had been assisted with the help of over 1000 volunteers. According to her, JAN provided free programs to youth aged 5 to 27 based on its 3 pillars for success, which are entrepreneurship, work readiness and financial literacy, with the mission to inspire & educate young people to become conscientious business leaders, by implementing skills necessary for personal success and social responsibility. In his welcome address, the President/CEO, World Stage Limited, Segun Adeleye said that the alarming rate of unemployment in Nigeria should not only be of great concern to the government, but also to the private sector and other critical stakeholders in the economy. He assured participants that the summit will not end like similar conferences on Nigeria with little or nothing to show for them, as it was already being pushed online and in the social media through the #WorldstageEconomicSummit2016 for the sake of other stakeholders that were not fully represented at the summit. He said the presentations at the summit will also be made available to the government, and there will be necessary follow up on all resolutions with all stakeholders. Pix: L-R: Mr Kanmi Ayodeji, Manager Planning, Department of Petroleum Resources, representing Mr. Mordecai Ladan, Director, DPR; Mrs Omolara Aromolaran, MD/CEO, Crown Natures Nigeria Plc; Tobe Ifeanyi, Manager, Marketing and Communications, Junior Achievement Nigeria (JAN); and Dr Dele Oyeku, Director, Extension & Linkage, Federal Institute of Industrial Research Oshodi (FIIRO), representing Dr. Gloria Elemo, Director General/CEO, FIIRO, at the WorldStage Economic Summit 2016 at the Lagoon Restaurant, Victoria Island, Lagos, Nigeria on Wednesday, November 16, 2016.